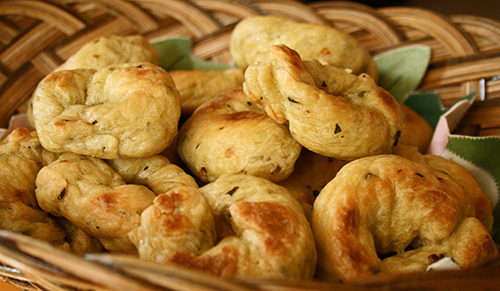 Here are some delicious little bites from Gina DePalma’s Dolce Italiano. 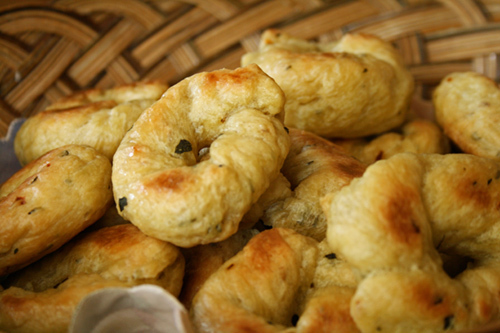 They’re savory, not sweet, and have been described as the Italian version of a pretzel. With red pepper, oregano, olive oil, and white wine as part of the ingredients, I would just describe them as mouth-watering. Here is a quick and easy summer pasta salad with nutty twist. And actually, an Asian twist, too. 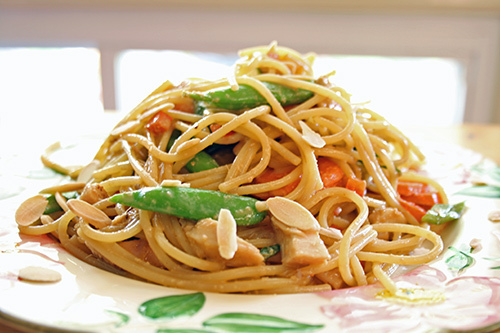 In the time it takes the pasta to cook, the vegetables can be prepared and the sauce made. I added chicken to the mix, but this tastes just as good vegetarian. Enjoy! Prepare the sauce by adding all the ingredients to a blender, and blend until smooth. Place your pasta in a pot of boiling water, return to a boil, and cook til al dente. Meanwhile, trim the snap peas, peel and thinly slice (on the diagonal) the carrots, and dice the red pepper. Place in a large bowl with the diced chicken. When the pasta is done, drain and run under cold water. Transfer to your large bowl with all the salad ingredients. 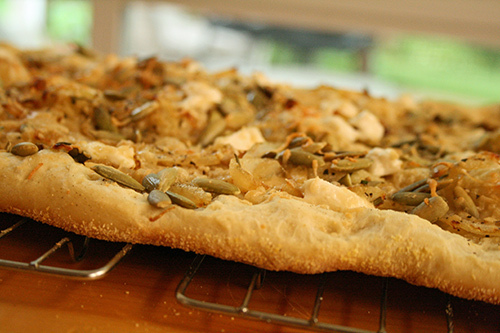 Toss gently together, add the dressing, toss again, and garnish with the toasted almond slices. Serves 6. 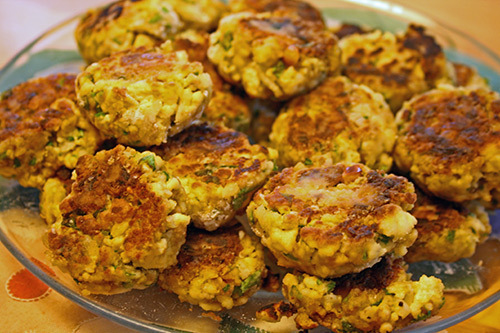 I tried another fantastic recipe from the Little Bits blog – Tofu Balls. Besides having really great photo displays, and lusciously creative endeavors, this blog is just chock full of nibbles that inspire me. So I tried the tofu balls tonight. They did not disappoint. Absolutely yummy. And addictive, too. I fried mine in a scant amount of oil, instead of baking, so in order to get them done well I flattened them out into patties instead of keeping them as balls. I made the peanut butter and soy balls this time; next time I’ll be trying the red curry coconut balls, yes indeed. Enjoy! Press the tofu for at least 30 minutes to remove most of the liquid. Crumble the tofu in a large bowl and mix with the rest of the ingredients. Adjust seasonings as needed, and shape into balls. Coat each ball with flour. Fry in a skillet with about 1-2 tablespoons canola oil. When you place the balls in the pan, mash them to make them flatter for easier and more complete browning. These are done when browned on each side. Serve with dipping sauce. Makes about 2 dozen patties. Whisk together the first 4 ingredients. Then add the peanut butter and whisk until it reaches YOUR desired consistency. Add a little water if it’s too thick. Chef John, you’ve done it again! 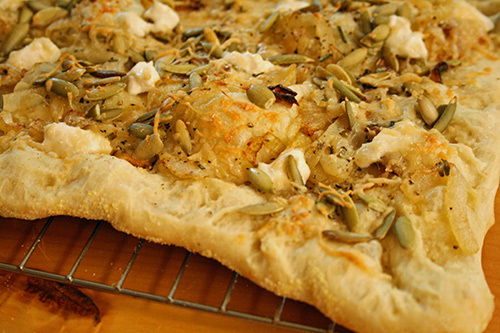 With your Pumpkin Seed Flatbread. I can’t believe I Ate. The. Whole. Thing. Wow, was that good. Actually, beyond good – more like, the best. And that was with my non-dairy modifications, too. 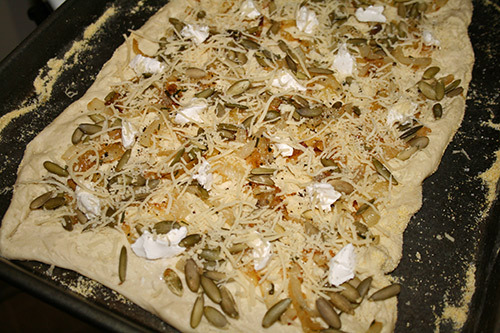 I subbed little pats of soy cream cheese for the feta, and sprinkled soy parmesan for the reggiano. Just outstanding. This went great with a vinaigrette salad. Try it, you’ll love it. I guarantee it. This week’s Presto Pasta Nights Roundup! It’s up and running at Thyme for Cooking, and it looks delicious, too. No, those are not spaghettio’s. It’s aneletti pasta, and I think it’s great. I found these round and chewy rings at Trader Joe’s, and they made the perfect foil for the spicy lentil sauce. Italian meets Indian. Enjoy! In a medium saucepan, bring 1 1/2 cups of water to a boil. Add your lentils, bring to a boil again, then turn town the heat, cover, and simmer for about 40 minutes. While the lentils are cooking, heat the oil, onions, and garlic in a large pan. When sizzling, add the dried spices and stir so everything mingles well and the onions begin to soften. Add the tomatoes and brown sugar, and stir in well. Turn down heat to simmer and let everything stew. Meanwhile, bring a large pot of water to a boil and add your aneletti. Cook according to package instructions (about 10 minutes) until al dente. Drain. 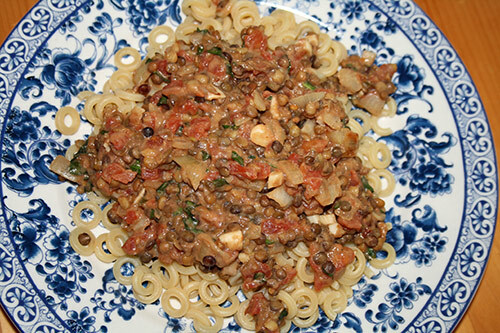 Just before serving, add the soy yogurt and basil to the spicy lentils, stir thoroughly, and spoon over aneletti. Makes 6 servings. So creamy and comforting, this polenta will fool even your most diehard cheese fans. Using soy sour cream and soy parmesan, this polenta takes on just the right texture and taste. 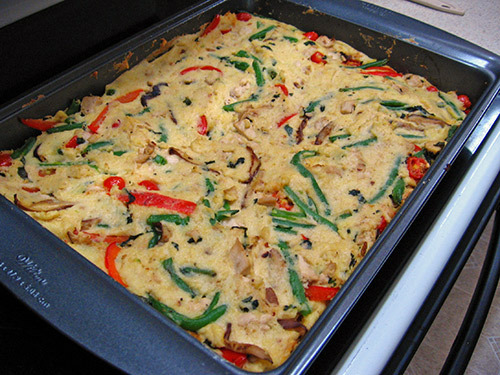 With sauteed veggies stirred in, their flavor infuses as it bakes, and the whole dish just works so well. 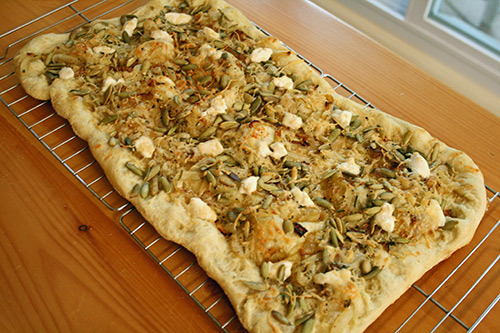 Serve with a salad and your favorite bread on the side. Enjoy! Preheat the oven to 350 degrees Fahrenheit. Spray cooking pan with non-stick spray. Mix together the water, polenta, and salt. Pour into prepared pan, and bake for 40 minutes. While the polenta is baking, heat the olive oil in a large pan, and saute the shallots til soft. Add the string beans and continue to saute for 8 minutes, stirring occasionally. Add the red pepper, mushrooms, and tomatoes, and saute until softened. 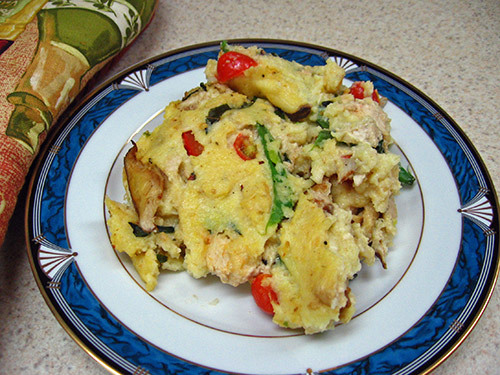 Combine together the sour cream, soy parmesan, basil, sauteed veggies, optional chicken, and salt and pepper. Stir into the cooked polenta, and bake for 25 minutes more. Serves 8.